Funds have been raised, and now prospective contractors have been made aware. Many, many wheels have been set in motion toward the next stop on our journey to a new, historically sound slate roof atop Lancaster Central Market. 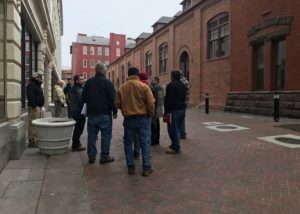 If you’re just tuning in, the Central Market Trust identified the aging asphalt roof of Market as cause for concern in 2010, at the dawn of a major renovation project to upgrade interior functional aspects of the Market House. Knowing that its replacement would involve major fundraising, it was deemed at the time that the project would need to be completed at a later date. And that date is imminent! Because the 1889 Market House is on the Secretary of the Interior’s Register of Historic Places, a recommendation was made that slate be used to replace the asphalt roof – both to restore the roof to its original state and to make an investment in the preservation of this special place for the next 100 years. Therefore, the Central Market Trust launched a fundraising campaign in the Fall of 2016, with a goal of raising the estimated $1.5 million for the project. It was incredible to see the community band together in support of the beloved Market that stands in the heart of the City of Lancaster. And as a result, the Trust met its goal by Spring of 2017. All of which brings us to earlier this week, when prospective contractors met at City Hall for a pre-bid meeting. They gathered in reviewing the scope of the project, asking questions, and visiting Market for further review. It is an exciting milestone to have hit! Only to be soon outdone by the next on the list, though, when the sealed bids are submitted to the City by April 4, 2018. Shortly thereafter, the City will open the bids, review them, and choose an official bid based on the combination of most qualified contractor and lowest bid submitted, and will award a contract within a 60-day timeframe for work to begin raising the roof. There is still much work to be done, but bit by bit, we are making our way toward raising a new beautiful roof at Lancaster Central Market. Please stay tuned as we share the details of this exciting process! Each of the following donors have contributed $500 or more to raising the roof. We are so grateful for your generous support! Mr. & Mrs. Eugene Gardner, Jr.
Mrs. Milton K. Morgan, Jr.